The time has come to seek a small business loan to expand your business – but where do you start? How do you know that you are getting a good deal and that there is not something better just around the corner? How can you compare one product against another to be sure that you are getting the best product for your business? Business lending is very different from personal lending. A personal loan company will have to advertise their APR (Annual Percentage Rate) along with a representative example of finance in order to comply with the law, promote transparency and give clients an accurate idea as to how their loan will work. There is currently no such legislation for business lenders, and as such the APR rate of a small business loan is rarely advertised. Instead, lenders will use a variety of methods to portray their costs, some of which can be misleading in the sense of making small business loans look cheaper than they are in reality. Let’s take a look at some examples of these different interest rates. Below is a table comparing the total cost (including admin fees and interest) of a £10,000 loan along with the interest rate that each provider advertises. 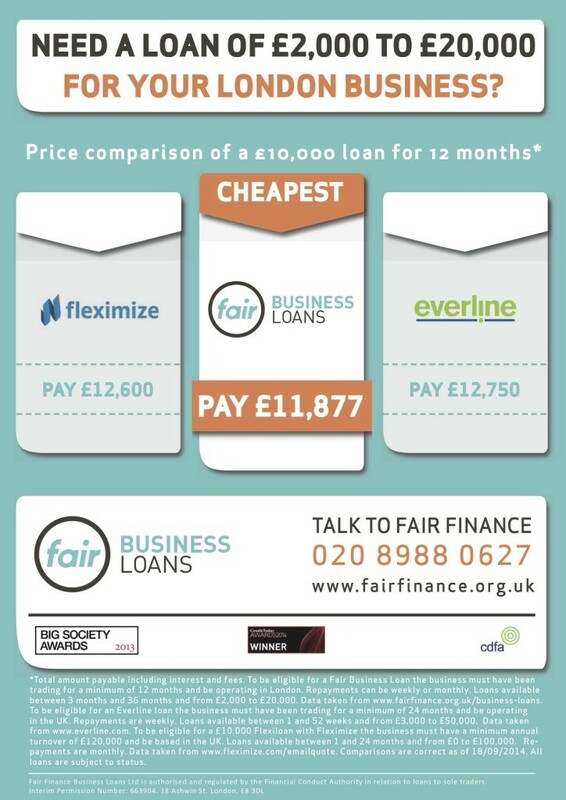 We have taken examples from Everline (Wonga’s business lending arm) and Fleximize as well as our own. Fixed Interest Rate: This is when you pay interest on the full amount of your loan, no matter how much you have left to pay. For example, if you borrowed £10,000 last year, and only have £1,000 left to pay, your interest will still be calculated each day as if you still owed the full amount. Everline calculates their loans in this way. Reducing Interest Rate: This is when you only pay interest on the remaining value of your loan. Using the same example as above, if you have £1,000 left of a £10,000 loan then you will only be paying interest on that £1,000. At Fair Business Loans, this is the method we use to calculate our client’s loans. Also, beware providers quoting monthly or daily interest rates: Advertising monthly interest rates makes the interest appear smaller, whereas if you actually annualise the rate from providers (multiply by 12 to give a rough indication) who advertise in this way then you will normally find that it is very high. For an initial discussion about your small business funding needs, contact Fair Business Loans today! We are confident that our open and transparent approach – as well as our great value products and straightforward processes - will make us stand out from the rest, and help you achieve your business goals sooner than you ever dreamed possible.